Don't we all know someone who, as a kid, looked up at the sky with a raised eyebrow, took a deep breath, and asked everyone around if they could smell what the Rock was cooking? Heck, we may have been that very kid, who tried to chokeslam or suplex our siblings. For most of us though, this may have remained as just pipe dreams. Not so for WWE star Saraya-Jade Bevis aka Paige. Fighting with my Family is a fictionalised take on her story, which was first showcased in the 2012 documentary of the same name. 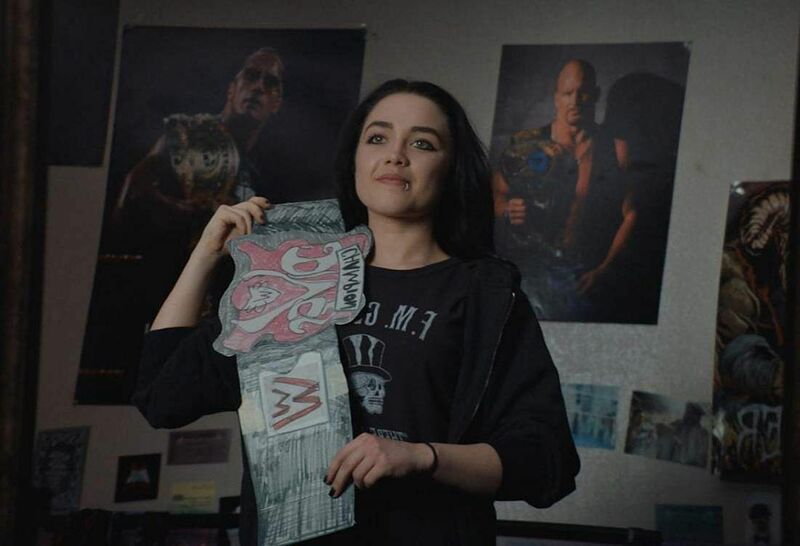 The film begins with a 13-year-old Saraya, rechristened as Britany Knight, joining forces with her brother Zak "Zodiac" Knight, to perform in their parents' wrestling company in Norwich, and harbouring the dream to make it to the biggest stage of them all, the World Wrestling Entertainment. In any sports drama, it is not the what but the how that matters, and this more true here, given this is based on a true story. Stephen Merchant's impressive writing and the affecting performances, however, keep us invested for the entirety of this 108-minute, seen-it-all-before movie, which traces Paige's (a brilliant Florence Pugh) journey from her humble beginnings in the UK to that explosive debut on Monday Night Raw. While wrestling might not be everyone's cup of tea, Fighting with my Family is more than just wrestling. Yes, it is the usual uplifting story of an outcast beating the odds to make it to the top, but it is also about a dysfunctional family, shattered dreams, shared ambitions, the futility of perceptions, and more. Every member of the cast, including Nick Frost and Lena Headey as Paige's parents, Jack Lowden as her brother, and Vince Vaughn as the wrestler-turned-coach Hutch Strong, helps keep things interesting whenever the film travels on the cliche path. For instance, Hutch is your typical no-nonsense coach, who keeps mouthing motivational lines, but credit to the makers for making even those done-to-death dialogues seem fresh. Hutch terming WWE, a "Soap opera in Spandex" brought the roof down. The wry, deadpan, British humour works like a charm. There are several cameos from wrestlers like Big Show, Sheamus, and an extended appearance by Dwayne "The Rock" Johnson, who turns back the clock to give us a glimpse of his "electrifying" on-stage persona. There are also subplots that talk about the plight of "jobbers" (journeymen who are used to boost the star wrestlers) and the reasons why models and cheerleaders become professional wrestlers. But the film still stays true to its title and keeps its focus on the various problems within this "weird" family. That said, it just barely scratches the surface of these issues and seems more concerned about leaving us with an overall warm, fuzzy feeling. This is probably why the film doesn't talk about the various controversies that hit Paige's life after her WWE debut. I remember watching the episode of Raw which launched Paige's career. The NXT champion walked into the ring to roaring applause as she engaged with the defending Divas Champion, AJ Lee. What happened next is, as cliche as it might sound, history. Stephen's retelling of these events is slightly different, and understandably so. When Pugh stands on top of the turnbuckle holding that Divas Championship belt over her head, you can't help but smile. As Hutch says to a group of aspiring wrestlers, "Though fans know it is all fictionalised, they do know when you're not being real." You know this not exactly what happened on April 7, 2014. But that moment is not just for Paige. It is also for those kids who practised wrestling moves on pillows. It is that emotional upheaval of watching somebody live your dream. A dream that is finally realised.